Don’t panic! With some planning and creativity, you can come up with fun ideas your kids can do (and you can participate too!) to keep them interested and happy. Host a read-in party: Invite your child’s friends over for a book reading. Set out cushions, some snacks and encourage the kids to read their favorite books and talk with each other about why they like them. Have your kids produce their own movie: Kids today are amazingly tech savvy and with free apps like Action Movie FX and Stop Motion Studio, your own cell phone can become a professional film camera. Let them take video running outside, playing with the dog or chronicle daily life in your household. Let them edit and add sound effects, then have a screening party for the family. Have a box challenge: Pick up boxes from a grocery store or big-box retailer. Challenge your kids to come up with the most original creation. You’ll be amazed how much your kids will be entertained designing cars, houses and forts! Prep the next generation of chefs: Encourage your child to pick an easy recipe that sounds appealing. Go the grocery store to pick out ingredients and then prepare it together. Library: The library is a great resource not only for free books, movies and music, but also for great year-round activities. Area libraries often host author visits, sing-alongs, art classes and more! Check out the Orange, Osceola and Seminole counties library pages. Parks: Check out local parks for playgrounds, events, hiking trails and splash pads for free fun. Outdoor movies: Central Florida is full of free outdoor movies. Check out the listings for upcoming showings near you. 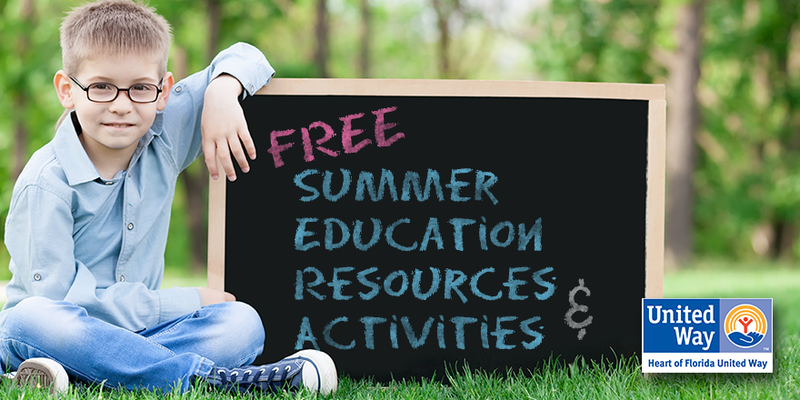 Orlando Moms: From budget-friendly cooking tips to summer educational activities, this blog is a great resource for anyone with children. PagingFunMums: Not specific to Central Florida, this site is terrific for anyone looking for fun ways to keep kids learning. Our favorite post is “20+ At home Science Projects”. SeaWorld Mommy: This blog has information and reviews about local attractions and events. Orlando Mommy: this blog is a great resource about events in Orlando, and they even include some cost-savings tips. We love their list of “100 Things to do in Orlando”. Heart of Florida United Way believes education, both in and out of the classroom, is a lifelong experience and the most influential factor in ensuring a child will grow up to succeed. For more information about how Heart of Florida United Way invests in education, visit www.hfuw.org. The Children’s Dental Education and Fluoride Varnish Project Offers Preventative Care to Local Students Michelle Lawton remembers vividly the moment she became a dental care advocate—she had been working as a dental assistant at a local practice when a patient found out she needed over $7,000 worth of dental care and started to cry. It’s the focus on prevention instead of intervention, a key tenant of the United Way philosophy, which caused Lawton and her friend Julie Michael, Executive Director for the Dental Care Access Foundation, to work with Heart of Florida United Way to develop the Children’s Dental Education and Fluoride Varnish project which is funded through the United Way’s health focus area. In its second year of operation, the Varnish project has served approximately 4,000 students; 1,100 which were funded by United Way. As a result, more of the students are getting appropriate dental care and are missing less school due to tooth-related problems or pain. As part of this initiative, Michelle and Julie have partnered with Valencia Dental Hygiene students and the UCF Pre-Dental Student Association to go directly to Orange County Public Schools. Through the program, they offer one-on-one dental education, where they teach proper dental hygiene, brushing tutorials, and nutrition information.Each child is also provided with an age-appropriate dental hygiene kit, including a toothbrush, toothpaste, and floss. Afterwards, they then apply a topical fluoride varnish to help prevent cavities from developing. Michelle and Julie also help families navigate the healthcare system and explore their options. If during the consultations larger problems are discovered, they can refer families to low-cost clinics and community health centers for treatment. This program is a huge change for students. The varnish can be applied in a matter of seconds and the one-on-one sessions serve as a gentle introduction to the dentist. With a laid-back approach and appearances from the UCF Pre-Dental program mascot Timmy the Tooth, the kids learn the dentist is not something to be scared of. For more information about the Dental Care Access Foundation and how you or your company can support the Children’s Dental Education and Fluoride Varnish project, visit www.DentalCareAccess.org.